Today we are THRILLED to be presenting an exclusive excerpt from The Hero’s Guide to Saving Your Kingdom by Christopher Healy, and featuring some of the book’s original art by Todd Harris. 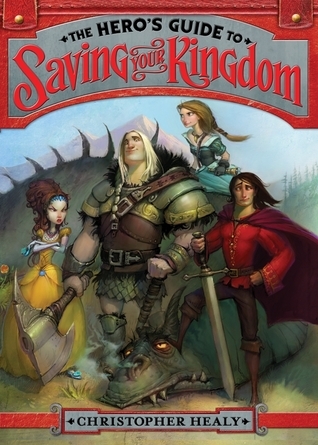 Look for The Hero’s Guide to Saving Your Kingdom in stores May 1st! Among the dozens of elegant women at the ball that night, there was one girl who caught Frederic’s attention immediately—and it wasn’t just because she was beautiful and elegantly dressed. No, she had something else: a daredevil gleam in her eyes. He’d seen that look only once before—in that old knight all those years ago. Frederic and the mystery girl had the time of their lives dancing together. But at midnight she ran off without a word. “Father, I have to find that girl,” insisted Frederic, newly inspired and feeling a bit more like his seven-year-old self again. Frederic shrank away. That tiger episode had really done a number on him. But Frederic didn’t give up entirely. He instructed his trusted valet, Reginald, to find the mystery woman for him. It turned out that Ella (that was her name) wasn’t a noblewoman at all; just a sooty cleaning girl. But her story—the way she mixed it up with a fairy and used magical means to escape her wicked stepfamily—intrigued Frederic (even if he hoped he’d never have to meet any of her relatives). Up until that point, Frederic had always believed that the king enforced strict rules because he feared for his son’s safety. But now he saw that wasn’t necessarily the case. So, for the first time, Frederic stood up to his father. In truth, Frederic was utterly intimidated by the thought of venturing out into the real world. If his father refused to meet his demands, he had no idea if he would be able to follow through on his threat. Luckily for him, the king was shocked enough to give in. And so, Ella came to live at the palace. She and Frederic were officially engaged to marry, and the tale of the magical way in which the couple met became the talk of the kingdom. Within days, the minstrels had a new hit on their hands, and the tale was told and retold across many realms. But while the popular version of the story ended with a happily-ever-after for Prince Charming and Cinderella, things didn’t go as smoothly for the real Frederic and Ella. Rejected by their princesses and cast out of their castles, Liam, Frederic, Duncan, and Guztav stumble upon an evil plot that could endanger each of their kingdoms. Now it’s up to them to triumph over their various shortcomings, take on trolls, bandits, dragons, witches, and other associated terrors to becom the heroes no one ever thought they could be. Wow! Great Artwork! How can I get in touch with Todd Harris? ?